The 'cake' finally made its first appearance in the U.S. this weekend, thanks to Darren Wong of NYC. The reactions are in and people are definitely excited. The Huffington Post even called it "the next Cronut." This cake definitely takes the edible water bottle hype to the next level. I'm dying to know how it feels and tastes. Does it taste like jello? Is the flavor at all similar to rain? Is it true that if it is not consumed immediately that it will melt away into nothing? 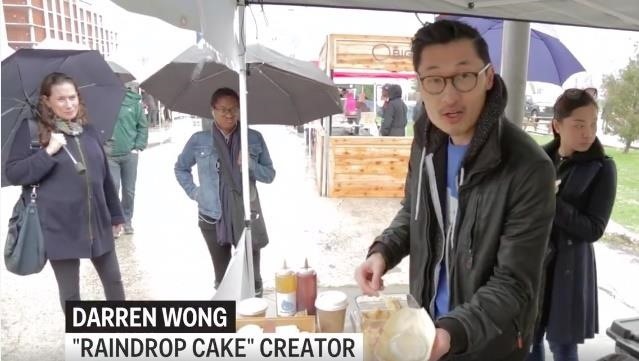 Wong is selling the raindrop cake for $8 at the Smorgusburg Food Market in NYC. 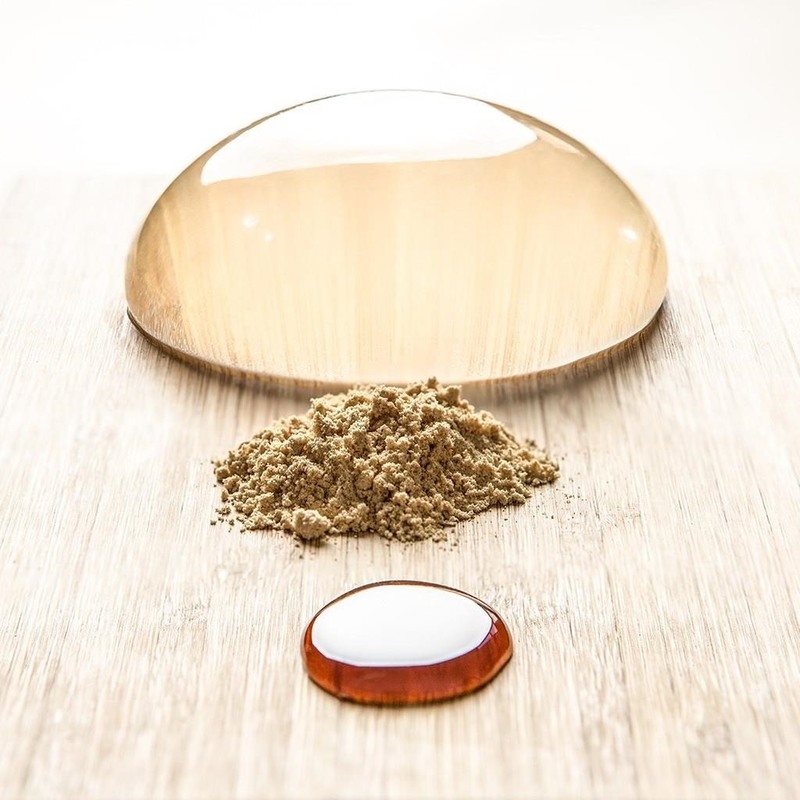 The raindrop cake, traditionally known in Japan as mizu shringen mochi, is a transparent and wobbly confection. The mystifying treat is made of natural spring water and agar agar (a gelatinizing substance from algae). Wong accompanies it with roasted soybean flour and a black, molasses-like sugar syrup to add both texture and flavor to the dish—because, as refreshing as rain sounds, it still needs sugar to be considered a cake. Instagram user Katherine Lam "waited in line for essentially jello," according to her post. "And yes it looked and tasted exactly like a raindrop." "It's good," Instagram user Megan Liew wrote, "just don't eat it by itself because it actually tastes like water. The powder adds a nutty taste to it and the syrup makes it sweet." I never thought I would say this, but these reviews make me think I'd definitely stand in line for jello that tastes like a raindrop. 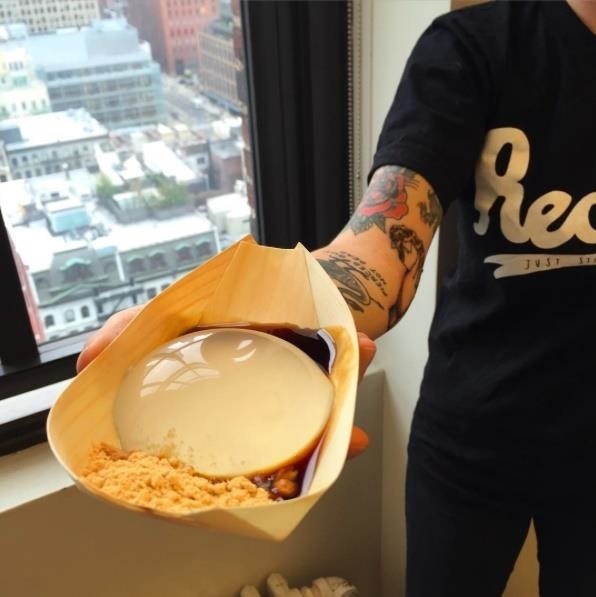 Tech Insider was on the scene of the raindrop cake's appearance at Smorgasburg, and heard mostly positive feedback. Excited tasters said the jelly cake "does taste like rain," that it was "so good," and, strangely enough, "It tastes like I'm eating a jellyfish," but in a positive way? While something that tastes like water doesn't sound too appetizing (why not just drink some water for free? ), it seems that the value of the cake lies in its texture. In fact, Wong spent 2 months perfecting the proportion of water to agar to achieve the perfect raindrop consistency. It must have been painstaking to perfect this recipe—cheers to him for his both his dedication and accomplishment. "The combination of textures and flavors goes together so well. There are very few foods that engage this many senses at the same time." Yes, the raindrop cake is mostly water. But as more feedback from both the press and fellow foodies is released, the most common reaction from most people (myself included) is: "I've gotta try that!" 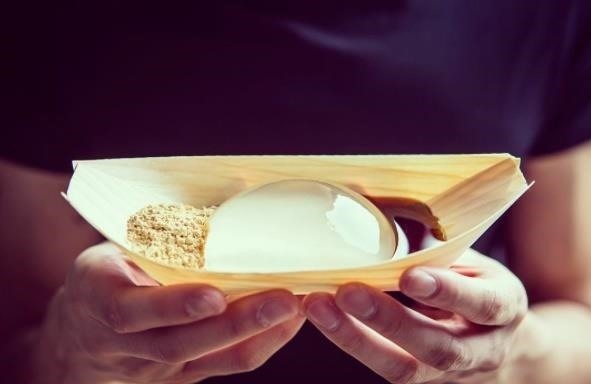 What do you think about the latest reactions to the raindrop cake? Would you stand in line for "rain jello?" Let us know in the comments below. It looks like you are just having rain drop.Its amazing how one can make a cake out of rain water. Give me a break... How does this item qualify as a cake?